After having beaten Mark Cavendish in the Dubai Tour, Marcel Kittel boosted his confidence even more as he won his first 2016 battle against André Greipel (Lotto Soudal) on the first stage of the Volta ao Algarve. After his Etixx-QuickStep teammates had controlled the stage all day, he held off his compatriot in the bunch sprint to take the stage victory and the first leader’s jersey. Jasper Stuyven (Trek) completed the podium. At the start of the 2016 season, many were curious to find out whether Marcel Kittel was still the fastest rider in the world after his illness-marred 2015 season. After all, André Greipel had firmly claimed the top spot of the sprinting hierarchy during Kittel’s absence and with a new team, it would be no easy task for Kittel to reclaim his position. 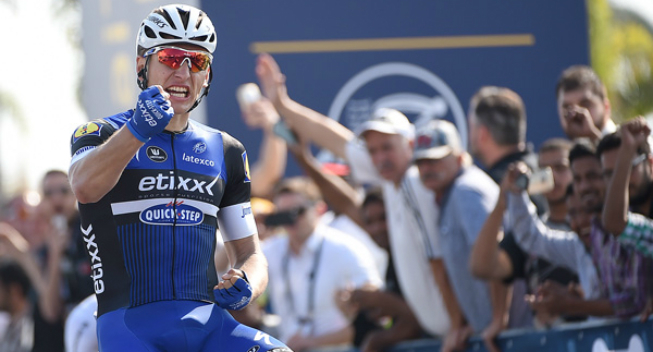 However, at the start of his second race with his Etixx-QuickStep team, it seems that Kittel is already back on top. At the Dubai Tour, he proved that he is still able to beat Mark Cavendish and today he came out on top when he first faced a duel with Greipel on the first stage of the Volta ao Algarve. The opening stage was a mostly flat affair that had bunch sprint written all over it and with Kittel and Greipel both in attendance, it was no surprise that Etixx-QuickStep and Lotto Soudal controlled the race all day. The Belgian teams slowly chased down a three-rider break which was brought back with 7km to go. However, the finale in Albufeira which features every year on the opening day in Algarve, is known for its many roundabouts and tricky nature, with a small climb leading to the flamme rouge and a downhill final kilometre. This made the peloton very nervous and in the hard fight for position, there were two crashes just after the 10km to go mark. The sprint trains battled hard for control as Etixx-QuickStep and Lotto Soudal went head to head and as they approached the flamme rouge, more riders hit the deck. However, the two German sprinting giants escaped the carnage and were ready to battle it out in the final kilometre. In the sprint, Kittel left no one doubting his speed as he managed to beat Greipel who had to settle for a rare second place. Jasper Stuyven completed the podium in a hectic finale that saw several non-sprinter make the top 10. With the win, Kittel takes the first leader’s jersey with a four-second advantage over Greipel. However, he is unlikely to defend his position as stage 2 offers the first big battle between the climbers. After a flat start, the final third is very hilly, with three smaller climbs leading to the uphill finish on Alto da Foia, the highest mountain in Algarve. It’s a 7.4km climb that averages around 6-7% and it will give the first indication of who’s going to win the race overall. The 42nd edition of the Volta ao Algarve kicked off with a 163.6km stage that brought the riders from Lagos to Albufeira. After a lumpy first part with one smaller climb, the riders entered flatter terrain in the second half. In the end, they faced a technical finale with numerous roundabouts and a small climb leading to a descending final kilometre which was expected to set the scene for a tricky bunch sprint. It was a sunny day in Portudal when 189 riders headed out for the neutral rider. One rider was absent as Davide Malacarne (Astana) didn’t take the start. With the stage expected to end in a bunch sprint, there was no big fight to join the early break and Domingos Goncalves (Caja Rural), Alexandr Kolobnev (Gazprom-Rusvelo) and Kamil Gradek (Verva ActiveJet) quickly got an advantage. At the 11km mark, they had already pushed their gap out to 1.22 and it had gone out to 4.15 just three kilometres later. After 28km of racing, the trio enjoyed an advantage of 6.30 which gave them plenty of time to contest the KOM sprint. Here Gradek managed to beat Goncalves and Kolobnev and so became the first KOM leader of the race. At the 35.5km mark the gap was 6.35 and as the chase had not started yet, it was 6.44 nine kilometres later. The riders covered 40.5km during the first hour. The peloton was still in no hurry and so the gap reached a maximum of 8 minutes at the 55km mark before LA Aluminios, Etixx-QuickStep and Lotto Soudal started to chase. The gap was down to 7.34 at the 58km mark as they slowly started to take back time. Gradek beat Goncalves and Kolobnev in the first intermediate sprint in front of a big crowd after 81.7km of racing. At this point, all the work was left to Etixx-QuickStep and Lotto Soudal who had reduced the gap to 4.10. Lotto Soudal had five riders on the front of the peloton, sharing the work with a single Etixx-QuickStep rider and they had brought the gap down to 3.40 after 89.5km of racing. The pace was still rather slow tough and it was still 3.37 at the 108km mark. Gradek also beat Goncalves and Kolobnev in the second intermediate sprint while the two Belgian teams kept the gap at around 3.30. Finally, they started to accelerate after the 120km mark and the gap was only 2.30 after 126km of racing. Gradek beat Kolobnev and Goncalves in the final intermediate sprint at the 145km mark as they tried to hold onto an advantage that was down to just 55 seconds. Eleven kilometres later, it was all back together and the scene was set for the bunch sprint in which Kittel came out on top.